The 10 Best Museums in Alabama! Since gaining statehood in 1819, Alabama has contributed much to the United States’ narrative. From immaculate art spaces to historical institutes, Alabama will surely satisfy all its visitors and residents. Check out these museums that capture the state’s rich culture and history. The Birmingham Civil Rights Institute is a highly engaging museum that accurately depicts the struggles of the Civil Rights Movement during the 1950s and 60s. The institute is located across from the 16th Baptist Church and Kelly Ingram Park, which are both historically significant civil rights landmarks. For any true college football fan, the Paul W. Bryant Museum will not disappoint. The museum illustrates the strong football history of the University of Alabama, and what the sport has meant to the state. The museum is a short walk from the historic Bryant-Denny Stadium, the place where it all happened. 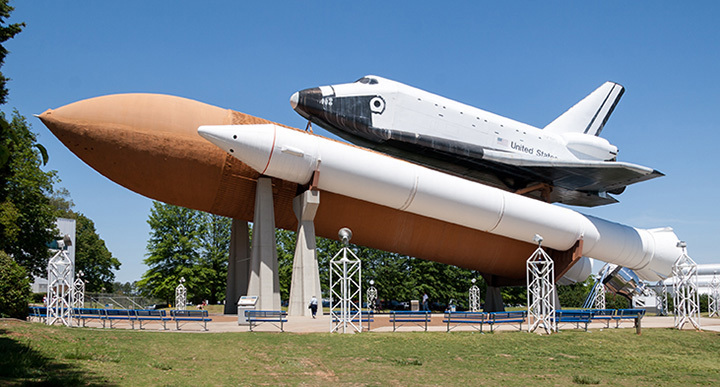 The U.S. Space and Rocket Center features rockets, space achievements and other fascinating artifacts that help to paint a picture of the U.S. space programs illustrious history. This museum will entertain just about everyone, but especially will keep the kids engaged. The museum holds a plethora of exhibits that children can interact with. The Birmingham Museum of Art has one of the most excellent collections in the Southeastern United States, holding more than 24,000 paintings, sculptures, prints, drawings, and other decorative arts. Founded in 1951, the museum has made a name for itself as a culturally rich institution and is home to several Asian, European, African, pre-Columbian, and American pieces, dating as far back as the 18th century. Appreciators of fine art will love what the museum has to offer. Founded in 1930, the Montgomery Museum of Fine Art is the oldest fine arts museum in the state. Home to both individual works and collections, the museum features regional, national, and European art. The museum also includes a hands-on exhibit for kids that is sure to pique the interest of younger art connoisseurs. The Mobile Museum of Art is in the heart of West Mobile, and features extensive art collections from the Southern United States, the Americas, Europe, Asia, and Africa. Enjoy a variety of works while walking through spacious galleries that foster an open mind. The building itself is a work of art, and is a must-see in Mobile. This museum honors the very best jazz artists with connections to the Heart of Dixie. Not only is the museum home to several lively exhibits, but has a beautiful vintage marquee that is frequently used to host events. This industrial museum, also known as the Tannehill Museum is situated in Tannehill Ironworks Historical State Park. Alabama is steeped in industrial history, and that’s all on display in this museum. The museum features artifacts like belt driven machines of the 1800s and other historic tools of the time. The Jule Collins Smith Museum of Fine Art is a famous art museum locate on the Auburn University campus. It’s the only university art museum in the whole state. Featuring stunning exhibits and works that will take your breath away, this museum creates an atmosphere that must be experiences. Be sure to check out the café that has a delicious tapas selection! Take a step back in time to the beginning of Mardi Gras. The museum chronicles over 300 years of the history of carnival, and is housed in the Bernstein-Bush mansion in downtown Mobile. Discover how Mardi Gras came to be with lively exhibits, specialists, and artifacts. Mobile Carnival Museum is a fun time for the whole family.